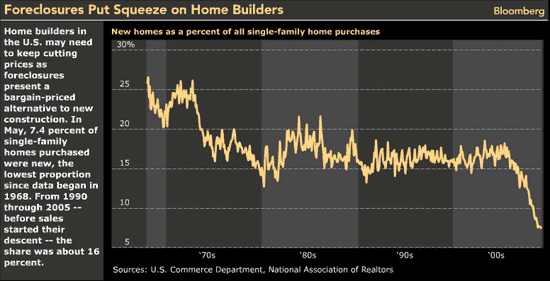 Deteriorating conditions in the housing market and consumer uncertainty over the economy is resulting in home builders seeing more red ink, as they battle their lowest market share on record. The combination of the market’s decline with the expiration of the tax credit at the end of November, and the continuing lack of credit for housing production loans, keeps suggesting we haven’t hit bottom yet, and there may be further deterioration in the coming months. From Bloomberg: Builders…battling their lowest market share on record, will need to keep cutting prices and offering upgrades to attract buyers as competition from foreclosures mounts, economists said. [As the chart] shows (click to enlarge) new-home sales represented 7.4% of all single-family purchases in May, the lowest level since data began in 1968. From 1990 through 2005, before sales started their descent, the share was about 16%. Builders have been hamstrung by land bought at premium prices years ago, and construction costs haven’t come down much, said Nicolas Retsinas, director of housing studies at Harvard University in Cambridge, Massachusetts.